Women as Presidential Candidates: Who Are They, and Why Are They Silent about Women's Rights? Russia remains one of the biggest global arms exporters. It uses the trade in weapons to not only earn money, but to expand its global geopolitical influence. A recent report by the Centre for Military Reforms (a Ukrainian think tank) and The Potomac Foundation, shows that Russia has entered relations of interdependence with many countries around the world, including NATO members. UkraineWorld met Denys Hurak, senior research fellow at The Potomac Foundation, and co-author of the report, to understand how Russia influences the world through the arms trade and what can be done about it. You can reach the shortened version of the interview below or listen to the full audio version here. The Potomac Foundation, together with the Center for Defense Reforms, recently published a very interesting and lengthy, hundred-page piece of research called "Geopolitical goals of the arms trade of the Russian Federation." What are the key arguments of this research paper? The main aims of this research are to explain to the world the significance of the arms trade as one of the geopolitical methods of Russian influence. The point is that everybody understands that Russia uses gas and oil trade as a lever of influence in different countries. For instance, regarding gas supplies to Europe through the Nord Stream-2 pipeline. This is a decade-long story starting from the Cold War. The arms trade is also a decade-long story, alongside the information and disinformation manipulations that Russia uses. But the arms trade has largely been away from the gaze of global attention. However, we think that it is at least as significant as the gas trade, and its consequences are far deeper and far more important to various countries and the West, as well. If we compare the Cold War period and present days what is Russia's stance in the global arms trade sphere? Has it become stronger or weaker? It is hard to say in such a simple way. In some points it is stronger, in others it is weaker. The volume of arms has decreased, but in terms of the influence of the Russian arms trade and sales to various countries, it remains powerful. For instance, if you take Russian influence in supplies to NATO countries , it had no presence in the period of the Cold War. But as of now, it has started to build up a presence and to influence the agendas of politicians of those countries. It is very interesting that you're talking about those NATO countries, because in Ukraine we had the scandal related to the delivery of mistrals by France to Russia. In this context, can you give us some more examples? When the Soviet Union collapsed, there was a certain period of uncertainty: can the West cooperate with Russia and post-Soviet bloc in general, including Ukraine, in the arms trade? Afterwards, this uncertainty ended and quite deep two-way cooperation began. Russia ordering the delivery of ships was not the only example of such cooperation. It mostly related to supplying components: for example, thermal vision sights for tanks are also supplied by French companies. Basically, all major arms producers in the West have some degree of contractual and business ties with Russia. Russia acts in the same way. But it cooperates mainly with post-Soviet bloc countries, like Poland or Czech Republic, because they still use Soviet equipment. It needs to be modernized and, therefore, these countries depend a bit on Russia. The bigger example in this regard is that some companies from NATO countries have started joint supplies from and development projects with Russian companies on space rockets. Companies from NATO countries cooperate with Russian companies on space rockets. US space rockets, which are produced by the company United Launch Alliance, use Russian engines for launches of space vehicles, which, in their turn, launch military satellites. When you talk about the current strength of the Russian arms trade, do you mean precisely the kind of strength that enables the world to be made interdependent and, therefore, world politics actors reluctant to impose sanctions against Russian enterprises? Exactly! That was the Kremlin's long-term plan, namely to ensure interdependency in supplies and in the sphere of substitution of components. The cycles in creation of military equipment are much longer than those in the civilian field because of stricter requirements. Therefore, it is quite complicated to change the supplies of rocket engines and such a change would take a few years. Just as an example, let's look at this problem at a glance. The US, of course, realized that it is very dependent, and discussions about such dependence started even before the annexation of Crimea in 2014 and the start of war in Donbas. Six-seven years have passed since then. The program of substitution was launched two years ago in the US. So, engines can start to be substituted in not less than five years. So, you can imagine the longevity of the cycle and the continuation of the influence, regardless of any developments? You need 6-7 years to overcome dependency in arms supplies. And such examples are very common for every country, even those that are not as affluent as the US. Thus, in one way or another, the majority of countries around the globe are dependent on Russia in the arms trade. Let's talk about the current situation, after the illegal annexation of Crimea and the support given by Russia to separatists in Donbas. There was a cycle of sanctions from the EU and the US in the main. How do you evaluate the defense component of it? I mean, were sanctions applied on issues related to defense and defense companies? Until 2017, the sanctions regime in the defense sector was quite weak. Some restrictions imposed by the EU and US on new contracts starting from August 2014 did exist. But there were quite a lot of exceptions. So, in the main, trade continued within the contracts that were in place before August 2014. After the 2017 CAATSA adoption by the US, it has become much complicated , but it still does not significantly influence the process. My personal point of view is that it needs to be strengthened. Sanctions against Russia in the arms trade need to be stepped up. Let's talk about another type of dependence or inter-dependence: the Ukrainian and Russian one. We understand that Ukraine and Russia were parts of the bigger Soviet defense system, that production chains were important, and this continued once independence came about. Yanukovych even tried to strengthen this inter-dependence. Are these ties now broken? If so, who suffers the most? Of course, Ukraine suffers, but Russia suffers more, just because of the necessity for them to continue this trade and manufacture of defense equipment. For Ukraine, it is also very important to continue production for the purposes of its own army, especially at this time of war. But the system in the Soviet Union was built in a way that construction bureaus (cities like Dnipro, Zaporizhzhia, Kharkiv, Kyiv, other smaller towns which are located in all regions of the country that still have defense industry establishments as their main economy forming entities) and manufacture of components were based mostly in Ukraine. Because the center of competence and scientific expertise was in Ukraine. The finished products were assembled in Russia. It's much harder to re-create such items as aviation, ships, rocket engines, gas turbines, transport aircraft than the simple components that Russia used to supply to Ukraine. If we are talking about companies engaged in manufacturing then we can name Motor Sich, Pivdenmash, Antonov, Zorya Mashproekt. Russian arms supplies depend on big Ukrainian companies. Therefore, I would say, Russia finds itself in some sort of panic. Because old stocks are being depleted. And if it does not recreate these companies in the near future, it will lack the most important military capabilities, such as strategic airlift, etc. But this is also a vulnerability that Ukraine has, because there was talk before 2014 that such companies like Motor Sich are oriented only towards Russia, and if we lose this market, it will lead to the collapse of the whole sector. This argument, actually, did not prove itself. It's true that the companies lost a lot of markets, but all of them – Antonov, Motor Sich, Pivdenmash, Zorya Mashproekt – have managed to survive and are still functioning. Of course, if they don`t acquire new markets and develop themselves in cooperation with the West they will not be able to continue to operate and will lose their competitiveness. And this is the main vulnerability, not the current economic strength or weakness. The issue here is about the strategic ability to produce equipment and to supply it to our own army. Therefore, the main point of our study is to show that if Ukraine does not cooperate with the West in the defense industry and vice versa, the geopolitical consequences for the country will be disastrous. The time gap is closing, because in five years we will, eventually, lose our competitiveness and will not be able to meet the needs of our own army. We depend greatly on exports, where we're competing with Russia, and without Western support and investment we will not be able to continue development in this area. But, on the other hand, this research paper does not aim to ask the US to help and save us; it, actually, demonstrates Ukraine's strength and significance to the US. Because if we jointly produce defense products that are able to compete with Russia, and if we are currently on the same markets as Russia, we will be able to squeeze some volume from their market by reducing their geopolitical influence on those markets. What are those markets? Are they mostly post-Soviet ones or others? They relate to the Middle East, North Africa, Far East, Latin America and post-Soviet countries as well, including Poland, Czech Republic and other former members of the Warsaw Bloc. There was so much talk about arms supplies to Ukraine. However, there was an argument that the US should not supply arms but rather invest in the country's own capabilities. Do you agree with this argument? Not everything is black and white. Of course, if we talk about some emergency things – very important in 2014, when we simply did not have four-wheeled armored vehicles, light APCs or Javelins, – we needed those supplies at that time. In recent years Ukraine has managed to create its own capabilities because, in some cases, it is cheaper to produce some military items within the country for our own army. We already have some of them. Professionals in the US defense industry understand this. 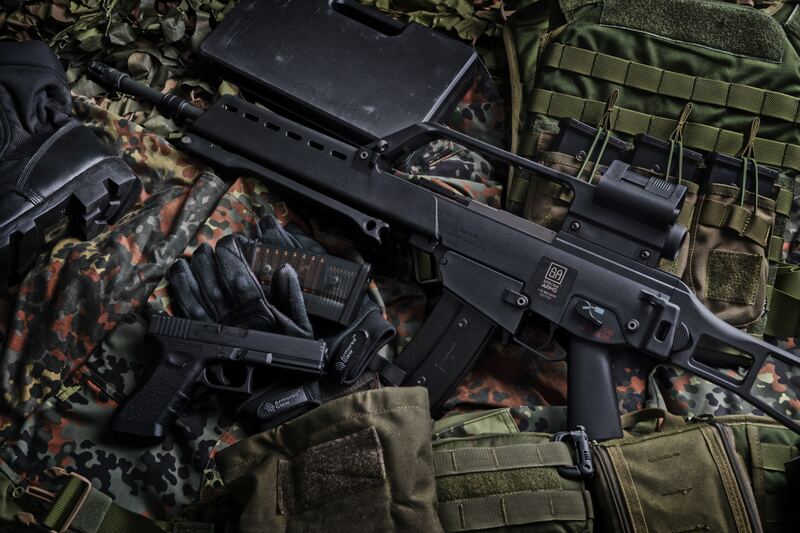 Ukraine has created its own arms production capabilities. VY: It is true that Russia did a great deal to disarm Ukraine before its aggression. The two defense ministers in office during Yanukovych's presidency were Russian citizens, and we understand how much country's defense sector suffered and this was probably one of the reasons for Russian aggression. DH: Definitely, it was a clear strategy which had long-term planning. We can be philosophical about a better world, but when you're being attacked, there is no other way to defend yourself than to make arms and to use them. Kremlin News Fiction: Are We Ready?